Since 2018: Postdoc at University of Bonn, Department of Geography, Ecohydrology and Water Resources Management working group, involved in e.g. PARADeS (Participatory Assessment of Flood Disaster Prevention and Development of an adapted coping system in Ghana) Link. 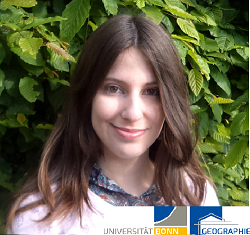 2015-2018: Ph.D. in Geography University of Bonn, Germany Thesis title: A participatory multi-criteria approach for flood vulnerability assessment. 2007-2011: B.Sc. in Environmental Engineering (2007 to 2011) Lutheran University of Brazil, Brazil Thesis title: Geoprocessing applied to the assessment of landslide susceptibility in Cascata district, Porto Alegre, RS. Brito, M.M. & Evers, M. (2016): Multi-criteria decision making in flood risk management: research progress and the challenge of handling uncertainty and stakeholder participation. In: European Geosciences Union General Assembly 2016. Proceedings. Vienna, Austria. Brito, M.M. & Evers, M. (2015): Review Article: Multi-criteria decision making for flood risk management: a survey of the current state-of-the-art. Natural Hazards and Earth System Sciences Discussions, v. 3, p. 6689-6726. Brito, M.M. & Mioc, D. (2015): Reliable floodplain delineation from hydrological predictions and digital terrain models in Iguaçu watershed, Brazil. In: International Cartographic Conference, 26. Proceedings. Rio de Janeiro, Brazil. Brito, M.M., Weber, E.J., Silva Filho, L.C.P. (2015): GIS-based landside susceptibility mapping using analytical hierarchy process: a case study in Porto Alegre municipality, Brazil. In: International Conference on Multiple Criteria Decision Making, 23. Book of Abstracts. Hamburg, Germany. Brito, M.M. (2015): Identification of landslides scars in the Eastern Edge of the Paraná Basin based on Landsat 5-TM images. Revista Brasileira de Geografia Física, v. 8, n.1, p. 56-70. (in Portuguese). Brito, M.M., Gaizzon, E.M.A., Korzenowski, C., Araújo, S.F., Alves, A.L., Passuello, A., Pauletti, C., Silva Filho, L.C.P. (2014): A participatory and integrated flood risk management experience: Belo Horizonte, Brazil. In: International Conference on Flood Management, 6. Proceedings. São Paulo: ABGE. Brito, M.M., Fontes, P.W., Pauletti, C., Passuello, C., Job, J.M., Silva Filho, L.C. (2013): Selection of priority municipalities for mass movements risk mapping in the Rio Grande do Sul State. In: Brazilian Congress of Engineering Geology and the Environment, 14. Proceedings. Rio de Janeiro: ABGE. (in Portuguese). Brito. M.M., Weber, E., Pauletti, C. Passuello, A., Silvo Filho, L.C.P. (2013): GIS-multicriteria decision analysis for landslide susceptibility mapping in Porto Alegre municipality: a methodological proposal. In: UFRGS Postgraduate Conference, 3. Proceedings. Porto Alegre: UFRGS (in Portuguese). Brito, M.M. & E. Weber (2013): Landslide susceptibility mapping in Cascata district with the use of geoprocessing techniques. In: South Brazilian Geology Symposium, 8. Proceedings. Porto Alegre: SBGEO. (in Portuguese). Lucena, R.B., Gaizzon, E.M.A., Oliveira, B., Bresolin, J.T., Brito, M.M., Pauletti, C., Passuello, A., Silva Filho, L.C.P. (2013): Improvement of fire risk perception to minimize the vulnerability: use of popular and technical knowledge. In: IX Civil Defense Conference. Proceedings. Joinville: Defesa Civil Nacional. (in Portuguese). Brito, M.M. & A. Farias (2013): Spectroradiometry of fruit trees and the effect of moisture on the spectral response of leafs. In: Brazilian Remote Sensing Symposium, 16. Proceedings. Foz do Iguaçu: INPE, p. 3245-3252. (in Portuguese). Brito, M.M., Weber, E., Fin,J. (2012): Landslide susceptibility evaluation with the use of GIS: application in the Cascata district, Porto Alegre, Brazil. In: Brazilian Congress of Geology, 46. Proceedings. Santos: SBGE. (in Portuguese). Brito, M.M. & L.C.P. Silva Filho (2011): Survey, spatial distribution and preliminary analysis of the flood occurrences in the State of Rio Grande do Sul from 1982 to 2008. In: UFRGS Scientific Initiation Conference, 23. Proceedings. Porto Alegre: UFRGS. (in Portuguese).